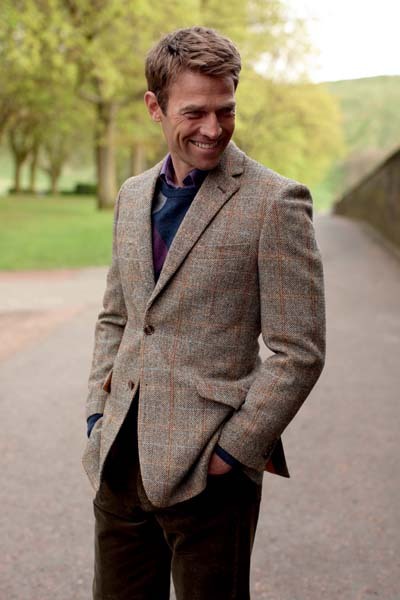 Tweed–you just don’t hear a lot of men shopping for this fabric near as often as they should. Especially, as the sun begins to set a little sooner, and the temperature dial begins to dive a little deeper. This Tweed Hamish Wool Jacket by Harris is durable, rugged, warm (100% pure virgin wool), and can be dressed either up or down, depending on what you pair it with. This jacket offers a nice neutral color to fit with a lot of the stuff already in your wardrobe, and it is a bit lighter in weight, which makes it perfect to wear alone in moderate Fall/Winter climates. You can also layer it with an overcoat and scarf if you need something to handle the bluster of a mid-winter Northern climate. One of the best ways to utilize a jacket like this is with another rugged material like denim or corduroy. But don’t worry about it being too rugged on your skin, as this jacket comes fully lined. Handmade in Scotland with an athletic cut and true fit. Tweed is the friend to any urban gentleman who like to dress both comfortably and appropriately. Don’t fear the tweed.